b. September 30, 1905, Bekesbourne (Kent), England. d. February 19, 1990, Avening (Gloucestershire), England. b. December 5, 1902, Miskolc, Hungary. d. February 5, 1988, Saxstead, England. Raymond Durgnat has discussed the difficulty of placing the remarkable work of the filmmaking team of Michael Powell and Emeric Pressburger within conventional ideas of auteurism: “They fit awkwardly into film theory, since Powell, though a true auteur, often thought more like an impresario, or a producer, who draws ideas from a team of collaborators.” (3) Durgnat’s description of Powell and Pressburger is both apt and illustrative of the impure, synthetic, spectacular, consistent and combinatory nature of their work. 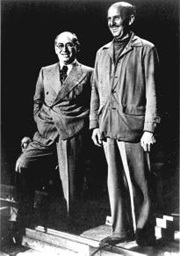 Both had careers separate from this collaboration – Powell worked his way up through the British film industry working with Rex Ingram, Hitchcock briefly, and as a director of ‘quota quickies’ in the 1930s, while Pressburger worked as a screenwriter at the mighty German studio UFA before fleeing to England after the rise of the Nazis – but it is the films they made together from 1939 (The Spy in Black) until the disbandment of their production company, The Archers, in 1957 that constitute their greatest overall contribution to world cinema. Powell in particular made great, interesting and even groundbreaking films (such as The Edge of the World  and Peeping Tom ) outside of this collaboration, but the string of works made back to back from 1943-1950 (The Life and Death of Colonel Blimp , A Canterbury Tale , “I Know Where I’m Going!” , A Matter of Life and Death , Black Narcissus , The Red Shoes , The Small Back Room  and Gone to Earth ) are their towering achievement. 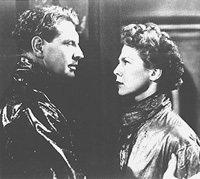 Even within the context of the golden period of British cinema in the late 1940s, Powell and Pressburger’s films are both exemplary and aesthetically unique, while still being quintessentially English. In the context of British cinema, Powell and Pressburger are often characterised as oppositional, almost maverick artists working within highly structured and generic production conditions. Almost every account of 1940s and 1950s British cinema (the key period in which Powell and Pressburger worked) pits two contrasting conceptions of cinema as dominating film practice and public reception. This contrast or dichotomy can be roughly summarised as a battle between forms of realism and escapist fantasy, comedy or melodrama. Most critical evaluations of British film in the decades between 1940 and the early 1970s generally favour those films which are more closely aligned with the techniques and traditions of documentary, realism and socially conscious drama (or its comic counterpart, the Ealing comedy). Thus, despite an affinity with some of these favoured characteristics, Powell and Pressburger’s films provide a challenge to orthodox conceptions of the strengths of British cinema, which have historically mostly relied upon clear distinctions, holistic definitions and organic models of critical appreciation. For example, A Canterbury Tale mixes together aspects of documentary, ‘realism,’ romanticism, expressionism and melodrama. Thus, the ‘difficulty’ of placing or situating Powell and Pressburger’s films is largely the result of their mixed and hybrid nature and the problems one encounters in trying to place them, even loosely, within one of these two basic traditions, and British cinema as a whole. Thus, there is a generally confused and schizophrenic response to Powell and Pressburger’s films that emerges from a critical standpoint that favours certain types and styles of film production, and often sees British cinema as an inevitable, if sometimes noble, failure. This position is exemplified by the overtly derogatory comments aimed at British cinema by François Truffaut in the 1950s and 1960s, most famously in his aphoristic statement; “to put it bluntly […] there [is] a certain incompatibility between the terms ‘cinema’ and ‘Britain’….” (4) Truffaut’s statement announces a degree of incompatibility between Britain (or England) and certain kinds of cinema; precisely the kind of ‘visionary’ and expressive cinema that is often seen as exemplary of cinema’s ontology. It is therefore not surprising that many critiques of Powell and Pressburger’s work focus upon its hybridised and synthetic nature, and are uncertain of its often incessant combination of somewhat disparate genres, tones and visual styles. These critiques note the debasement of pure, neat and understandable forms in their cinema; including the blurring of holistic definitions, boundaries and types of national cinema. This uncertainty of national origin or identity is indicated by the many references that numerous writers make to European traditions and heritages in their films. These references are applied to films that are still, essentially, extraordinarily British and even English in their tone, subject and characterisations. These deliberately and incessantly competing visions of cinema, realist and fantastical, pastoral and ostensibly artificial, are schematised in Powell and Pressburger’s amazing melodrama about British nuns stationed in the Himalayas, Black Narcissus. Sister Clodagh (Deborah Kerr), the head nun in an experimental convent on the rarefied outskirts of the British Empire, wants to build a pragmatic, practical and to all intents and purposes ‘realist’ world on an outcrop of land that is characterised by its extremity, excess, ability to evoke emotion and memory, and its status as a precipice between life and death. She wants to construct a controlled, stereotypically English environment upon a place defined by its extraordinary colour, impossible landscapes, absurd dichotomies, impossible to make out boundaries, operatic abstraction and, of course, by an openly visible fakeness. The film contrasts two modes of being, two worlds, and, essentially, two types of cinema. Durgnat has seen this opposition in terms of a colonialist contrast between the clichéd notions and representational conventions of what he calls “western balance” and “Eastern schizo-exoticism.” (5) But in keeping with the hybrid and synthesised nature of Powell and Pressburger’s films, he also suggests that these superficially distinct realms are in fact “sisters under the skin.” (6) They are also, in fact, good if simple descriptions of the dual and almost simultaneous tendencies in Powell and Pressburger’s cinema. Thus, in Black Narcissus, the spectator witnesses a battle or synthesis of two cinemas or worlds. Sister Clodagh seems to be surrounded by and suspect to a world that is far removed from the ‘realism’ conventionally associated with much ‘quality’ British cinema; a ‘realism’ she is attempting to impose upon this environment. Sister Clodagh’s failure to impose her will and vision is illustrated in two ways. First, the style of the film itself is openly artificial and studio-based, the combination of image, sound, music and colour attaining an almost operatic quality. Second, the memories that keep flashing back to Sister Clodagh, of her life before entering the sisterhood, resemble the emotional concerns and pictorial splendour of a Gainsborough period melodrama rather than the warm but somewhat grittier realism that one might expect considering the contrast that the film seems to be insisting upon and the character seems to be struggling with. These memories do not provide a contrast to the environment she has been placed within but rather reinforce its pictorial qualities and cinematic techniques. Thus, this ‘cinema’ is presented as overwhelming (a quality of Powell and Pressburger’s films generally). In the process, Sister Clodagh becomes one of the many of Powell and Pressburger’s protagonists who dream of a cinema, in this case involuntarily, which subsequently engulfs them. These approaches to what I would deem Powell’s Romanticism are routinely rejigged to suggest that he is not merely an artist out of time but also out of place. For example, in contrast to the palpable bloodlessness of British cultural life, Gavin Millar regards Powell’s work as an “unashamed expression of artistic passion – from which the English recoil in horror.” (8) It is therefore not surprising that it has taken some time to discover and rediscover the work of Powell and Pressburger, as the weird meta-cinematic and combinatory aspects of their work is much more in keeping with critical and stylistic trends that become more dominant from the 1960s onwards (and which favours self-consciousness, self-reflexivity and genre hybridity, amongst other things). In the process, Powell can start to be considered as a legitimate inspirational source of and potential father figure for modern British cinema (Ken Russell, Sally Potter and Derek Jarman in particular). In summary, Powell and Pressburger’s cinema has conventionally been regarded as something of an anomaly, a cul-de-sac, a singular body of work which cannot express or reflect the designated preoccupations of the British cinema. (9) It is within the context of Powell’s exclusion from the critical and national project of British cinema that some of Powell’s own claims about his films and their place within this cinema make most sense. For example, in the first volume of his autobiography Powell states, “I had made the British film industry after my own image, and I gloried in it.” (10) This apparently egotistical comment only makes sense once one has started to understand the complex nature, history and critical reception of Powell and Pressburger’s films (and Powell’s own understanding of this). But it also only makes sense once one recognises the personal, social, domestic and to some degree the cinematic nature and preoccupations of their work. I now turn to an analysis of more specific representational practices in Powell and Pressburger’s cinema with a brief description of two images. The first is an image common to the opening credits of the majority of films produced by this duo during the 1940s and 1950s: an arrow is heard whistling through the air and then seen thudding into the centre of a target. 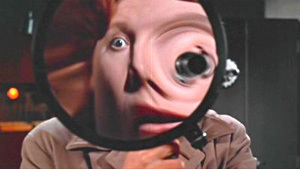 The second image is the close-up of a rapidly blinking eye that opens Powell’s most notorious film, Peeping Tom. Two images: one metaphorical and the other somewhat more literal. One of the ancient art of archery and the other more obviously reflecting the modern apparatus of the cinema. Both are images which vacillate around the primacy of vision and the vulnerability of the ‘eye’ and pre-empt the disruption to normalised patterns of seeing ‘cinema’ that these films, and Powell and Pressburger’s films in general, attempt to unravel. They are both also characteristically self-reflexive images which ‘prepare’ the audience for ‘shocks’ of the respective films that are to follow. The eye motif is recurrent and often holds a metaphorical or symbolic function in Powell and Pressburger’s cinema. These ‘eyes’ take on numerous guises in their work. For example, they are painted onto the side of a ship (The Thief of Bagdad ) and seen through rose-coloured spectacles (The Tales of Hoffmann ); they also appear as the organising eye of a camera obscura (A Matter of Life and Death), the swirling eye of a whirlpool (“I Know Where I’m Going!”), a hideously distorted and scared eye intensely staring into a ‘crazy’ mirror (in Peeping Tom), an all-seeing eye seized from the head of a Buddha (The Thief of Bagdad) and as the ‘vision’ and creation of the artist’s eye (Peeping Tom, The Red Shoes and Age of Consent ); and, as mentioned previously, the production company logo that opens most of their films features the eye of a target being pierced. The recurring and graphically varied motif of ‘the eye’ helps these films foreground the act and theme of vision. It also provides an analogue for the essential thematic, stylistic and representational preoccupations of Powell and Pressburger’s work. These eyes (real, virtual and metaphorical) entice the audience to look more closely at the film and unsettle or even comfort the spectator with their suggestion of a shared, self-conscious gaze. Other motifs in Powell and Pressburger’s films work in conjunction with that of the eye. For example, the image and theme of the ‘eye’ is often intertwined with the motif of an organised, ‘harmonious’ and panoptic vision in their work. This is evidenced by the many images of maps, extreme long-shot aerial perspectives, point-of-view shots of protagonists looking down upon other characters and the metaphorical and ‘actual’ vision of ‘gods’ or god-like characters that recur in their films. Collectively, these images produce a network of instances that vacillate not only around themes of vision, but also of familial organisation, and authorial and societal control. In keeping with this, Powell and Pressburger’s films often deploy optic, panoptic and mimetic devices or mechanisms in order to represent notions of authorial vision, directorial control and sight. These devices equally help foreground the core themes of shared values, places, origins and identities (particularly in a film like A Canterbury Tale). It is in this sense that Powell and Pressburger’s characters often attempt to organise the world through their own hermetically sealed and idealised vision, a vision that seems to be partially shared by the filmmakers themselves. The idiosyncratic fashion in which Powell and Pressburger deploy these select devices, connects their work to that of other such visionary directors as von Sternberg, Murnau, Bergman, Scorsese, Wenders, Egoyan, and Hitchcock. Certain works by each of these filmmakers might be similarly considered in terms of their idiosyncratic blurring of diegetic and non-diegetic elements, as well as their utilisation of lonely director-like figures who ‘control’ space, time, mise en scène and other aspects of representation. Thus, the pursuit of artistic success and ‘true’ vision is often a ruthless and dangerous business that serves to separate the ‘artist’ from the world they wish to ‘control’ and represent. This separation or distanciation is also felt by characters in Powell and Pressburger’s films – artists in a way – who wish to control or contain the world through some sort of representation: Colpeper’s lantern slide show in A Canterbury Tale, Reeves’ camera obscura in A Matter of Life and Death, Lermontov’s ballet in The Red Shoes, or the ‘closer-to-home’ home movies of Mark Lewis and his father in Peeping Tom exemplify this. Powell and Pressburger’s film The Tales of Hoffmann explicitly foregrounds the themes of vision, direction and audio-visual control that dominate their work. 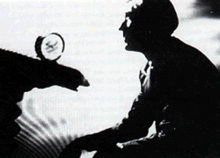 The Tales of Hoffmann is sometimes called a supreme example of ‘composed cinema’, a form “in which sound and image would be as closely integrated as they are normally in animation.” (11) In keeping with the explicitly synthetic and even symphonic goals of this ideal, Powell and Pressburger’s films are periodically preoccupied with the animation of the seemingly inanimate, the stilling, slowing down, speeding up and dissemination of filmic and other kinds of images and the illusion and breaking-down of continuous or ‘persistent’ vision within cinema when projected at 24 frames-per-second. 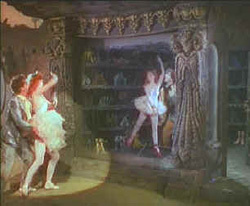 For example, in the centre point of the first tale, “The Tale of Olympia,” Hoffmann (Robert Rounseville), a poet who sees too much with a poet’s eye, is fooled by an inventor into believing that the magic spectacles he is wearing can bring to life the automaton Olympia (Moira Shearer) who sporadically dances before him. (12) This battle over Olympia is waged between two different conceptions of the medium of cinema: a conflict between a visionary and romantic mode of vision, which enables the subject to transcend and project into the image, and a mode that is self-aware of its mechanical/technological construction; a dialectical contrast which summarises some of the key tensions present in Powell and Pressburger’s cinema. In the end, Hoffmann falls in love with something that is reminiscent of the cinema and it is his inability to make a distinction between reality and illusion, self and screen, private and public and corporeality and simulation that fuels this love. This kind of existential crisis often defines characters in Powell and Pressburger’s films (and even Powell’s relationship to his own films). In keeping with many of the archaic preoccupations of The Tales of Hoffmann, Powell is also sometimes regarded as the last surviving filmmaker who grew up with the cinema (he died in 1990); a child of cinema who harks back to its early, fantastic days. At times it is also as if his (and Pressburger’s) films condense the convenient and often remarked on dichotomy of the Méliès and Lumière traditions. In the process, they explode the necessity of such a binary notion of the tenets of early cinema and subsequently of British national cinema. It is therefore not surprising that Powell is often discussed as an anachronistic aesthete in mid-twentieth century British cinema; a director who throws together the perceived floridness of nineteenth century melodrama, the values of Victorianism, the self-consciously faked pictorial dimensions of Victorian-era, family-based studio photography and the technical flourishes of a magic show. In this respect, despite the dynamic filmic and audio-visual dimensions of Powell and Pressburger’s ‘modernist’ cinema, it could be argued that their films are not really like cinema at all. Rather, aspects of and situations in their films are, in many ways, closer to some of the mechanisms that precede cinema such as the diorama, the camera obscura, the lantern show and the fakery and self-conscious ornamentation of much nineteenth century studio photography. This may seem like an absurd claim to make about films that are often visionary and routinely described as works of and about cinema (as I have done). Nevertheless, it is revealing that many of these earlier elements, media, institutions and representational forms are featured in their work. In many ways the films of Powell and Pressburger issue similar challenges to the viewer: to animate their tableaux and accept their mixing of realist and fabulist or fantastical modes. They also require that we bring much more of ourselves to the work by testing our conceptions of things like identity, nationality, community and family. In this sense, these films are often involved in the project or analysis of nation- and Empire-building. Several of Powell and Pressburger’s films can be said to skirt close to aspects of Powell’s private life, blurring clear distinctions between the world in and of the film and between fictional narrative and other forms of a possibly more personal cinema. The most disturbing instance of this occurs in Peeping Tom, in which home movies are used to represent and synthesise the relationship between the film’s murderer-protagonist (as a child, played by Powell’s actual son) and his long dead father (played by Powell). (15) This conflation of the public and the private, the communal and the personal, is also evidenced by Powell’s expressed relationship to his own work. Aside from appearing in several of his own films, Powell has been an active commentator on his own career and has produced a series of films that are often preoccupied with the problems, sacrifices and joys of artistic expression. Powell has also published two autobiographical volumes – A Life in Movies and Million-Dollar Movie – detailing the close correspondences between the films he made, the crews and actors who worked upon them, and his own private life. In some respects, Powell and Pressburger’s cinema can be regarded as a self-conscious synthesis of various cinemas and art forms. The antagonistic approach of many analyses of the interstices between such forms as photography, theatre, silent and sound cinema is hardly relevant to Powell and Pressburger’s markedly hybrid and non-denominational cinema. The ideal of a hybridised and ‘composed’ cinema that these films suggest is what Powell is alluding to in a quote from Rudyard Kipling, which serves as the epigraph to the second volume of his autobiography: “all art is one.” (17) In respect to the manifestly cinematic nature of Powell and Pressburger’s films, it is difficult to imagine a body of work which offers a more sustained and colourful riposte to Truffaut’s infamous dismissal of the British film industry’s anti-filmic nature. For in Powell and Pressburger’s films, cinema is amongst the central mechanisms through which national identity and character is celebrated, questioned and defined. 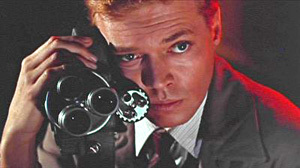 Many critics regard the making and release of Peeping Tom as a fitting finale to Powell’s career, while others consider his sojourn in the dormant Australian feature film industry of the 1960s as a less poetic and more apt epitaph. The two films that Powell made in Australia – They’re a Weird Mob (1966) (scripted by Pressburger under the pseudonym Richard Imrie) and Age of Consent – can either be read as diluted versions of Powell’s visionary cinema or as in keeping with the constantly adventurous, inquisitive and playful dimensions of the last 30 years of his career (they also revel in the humour that percolates throughout much of the director’s work). Though less ambitious aesthetically, these two films and those which follow, can be compared positively to the late work of the great Classical Hollywood masters such as Hawks, Ford and Hitchcock. At the same time, these two films are also considerably greater in ambition once we consider the social, political and cultural dimensions of their production (in the context of Australia at the time). The period of the 1970s and 1980s can be more correctly considered the autumnal period of Powell’s career; marked by a massive increase in his and Pressburger’s critical reputation, major retrospectives, his courting by filmmaker disciples such as Coppola and Scorsese (also working as consultant to both), and the last great work of his career, the mammoth two-volume autobiography that he almost completed before his death. Andrews, Nigel and Harlan Kennedy, “Peerless Powell.” Film Comment. 15.3 (May-June 1979): 49-55. Christie, Ian, “Alienation Effects: Emeric Pressburger and British Cinema.” Monthly Film Bulletin 51.609 (October 1984): 318-20. Christie, Ian, Arrows of Desire: The Films of Michael Powell and Emeric Pressburger. Rev. ed. London: Faber and Faber, 1994. Christie, Ian, ed., Powell, Pressburger and Others. London: British Film Institute, 1978. 4-52. Durgnat, Raymond, A Mirror for England: British Movies from Austerity to Affluence. London: Faber and Faber, 1970. Durgnat, Raymond, “The Powell and Pressburger Mystery.” Cineaste 23.2 (1997): 16-9. Film Comment 26.1 (May-June 1990). Contains essays on numerous Powell and Pressburger films including One of Our Aircraft is Missing, The Life and Death of Colonel Blimp, Black Narcissus and Peeping Tom. Film Comment 31.2 (March-April 1995). Contains essays on numerous Powell and Pressburger films including The Battle of the River Plate, The Tales of Hoffmann and Ill Met by Moonlight. Howard, James, Michael Powell. Batsford: Trafalgar Square Press, 1997. MacDonald, Kevin. Emeric Pressburger: The Life and Death of a Screenwriter. London: Faber and Faber, 1994. McVay, Douglas, “Cinema of Enchantment: The Films of Michael Powell.” Films and Filming 327 (December 1981): 14-9. Petley, Julian, “The Lost Continent.” All Our Yesterdays: 90 Years of British Cinema. Ed. Charles Barr. London: British Film Institute, 1986. 98-119. Powell, Michael, A Life in Movies. London: Heinemann, 1986. Powell, Michael, Million-Dollar Movie. London: Mandarin, 1993. Salwolke, Scott, The Films of Michael Powell and the Archers. Lanham: Scarecrow Press, 1997. Taylor, John Russell, “Michael Powell.” Cinema: A Critical Dictionary. The Major Film-makers. Ed. Richard Roud. Vol. 2. New York: The Viking Press, 1980. 792-4. Taylor, John Russell, “Michael Powell: Myths and Supermen.” Sight and Sound 47.4 (Autumn 1978): 226-9. Thomson, David, “A Romantic Sensibility.” American Film 6.2 (November 1980): 48-52. Wollen, Peter, “Dying for Art.” Sight and Sound ns 4.2 (December 1994): 1. Good BFI site with articles, filmographies and links to other sources. Good overview with links to each film. Reviews of various Powell and Pressburger films by Paul D. Goetz. Good French-language site devoted to the director, focusing on Peeping Tom. Adrian Martin’s annotation on this legendary film for the Melbourne Cinémathèque. Review of this film as part of the Jennifer Jones website. Capsules on their action and suspense films. Wonderful, exhaustive fan site from the Powell and Pressburger Appreciation Society. Includes general news, DVD news, lots of reviews and articles, image galleries, obituaries, film location information and FAQs. A good source to find Powell & Pressburger in PAL format. This line of dialogue is from the script of Peeping Tom. Michael Powell quoted in Ian Christie, “Chronicle,” Powell, Pressburger and Others, ed. Ian Christie (London: British Film Institute, 1978) 59. Raymond Durgnat, “The Powell and Pressburger Mystery,” Cineaste 23.2 (1997): 16. François Truffaut as quoted in Roy Armes, A Critical History of the British Cinema (London: Secker and Warburg, 1978) n. pag. Truffaut’s statement is used as the book’s epigraph. Raymond Durgnat, “… and in theory: towards a superficial structuralism,” Monthly Film Bulletin 51.609 (October 1984): 313. Durgnat, “… and in theory: towards a superficial structuralism” 313. Julian Petley, “The Lost Continent,” All Our Yesterdays: 90 Years of British Cinema, ed. Charles Barr (London: British Film Institute, 1986) 106. Gavin Millar, “Cox’s Orange Pippin,” Sight and Sound 59.3 (Summer 1990): 181. This separation from the project of British national cinema is exemplified by two incidents in Powell and Pressburger’s careers. First, Winston Churchill’s attempts to ban The Life and Death of Colonel Blimp due to what he deemed its dangerous lack of dogmatic and propagandistic patriotism and the film’s sympathetic representation of its central German character. Second, the hostile critical reception and commercial rejection that greeted Powell’s Peeping Tom upon its initial British release. For an account of the critical reception of Peeping Tom and how it relates to the general reception of Powell and Pressburger’s films see Ian Christie, “The Scandal of Peeping Tom,” Powell, Pressburger and Others, ed. Ian Christie (London: British Film Institute, 1978) 53-9. Michael Powell, A Life in Movies (London: Heinemann, 1986) 440. Ian Christie, Arrows of Desire: The Films of Michael Powell and Emeric Pressburger, rev. ed. (London: Faber and Faber, 1994) 69. The goal of this ‘composed cinema’ seems to preoccupy much of their work from A Matter of Life and Death onwards. It is perhaps significant that this automaton is played by Shearer, the lead actor from The Red Shoes; a film in which she wore a pair of red shoes that compelled her to dance and helped animate her body. The Red Shoes is another in the long line of Powell and Pressburger’s films about artistic passion, compulsion and the ‘direction’ of bodies and objects by impresario-like characters. Martin Scorsese, “Million Dollar Movies,” San Francisco Sunday Examiner and Chronicle 30 April 1995, Examiner Magazine: 16. One of other the tales within The Tales of Hoffmann, that of Giulietta (Ludmilla Tcherina), involves the stealing of Hoffmann’s reflection: a crisis of existential proportions in the mirrored and representationally self-conscious world of Powell and Pressburger’s cinema. Mirrors are used as reflexive devices in a number of Powell’s (and Pressburger’s) other films such as Black Narcissus, The Red Shoes, Peeping Tom and The Elusive Pimpernel. In many respects Powell’s performance is close in ‘intent’ to that of Martin Scorsese in his 1976 film, Taxi Driver. Both appearances hint at the violent potential that is unleashed by the ‘director’s’ actions, ‘directions’ and narrative fantasies. David Thomson, “Michael Powell: 1905-1990,” Film Comment 26.1 (May-June 1990): 28. Rudyard Kipling quoted by Powell in Million-Dollar Movie (London: Mandarin, 1993) n. pag.